Icelandic regional airline “Eagle Air” has put its Dornier 328 on commercial flights for the first time. This is the biggest aircraft for the whole history of the private company, which had been started 50 years ago with only Cessna 185. Flugblogger has sneaked to “Eagle Air” hangar to inspect the aircraft just before its inaugural flight, then has asked the founder of the airline Hörður Guðmundsson how new plane will changes airline’s business model, between which aircrafts he was choosing and what is the main problem with his current fleet. Historical moment. 5th of December, 16:00UTC, Reykjavik. 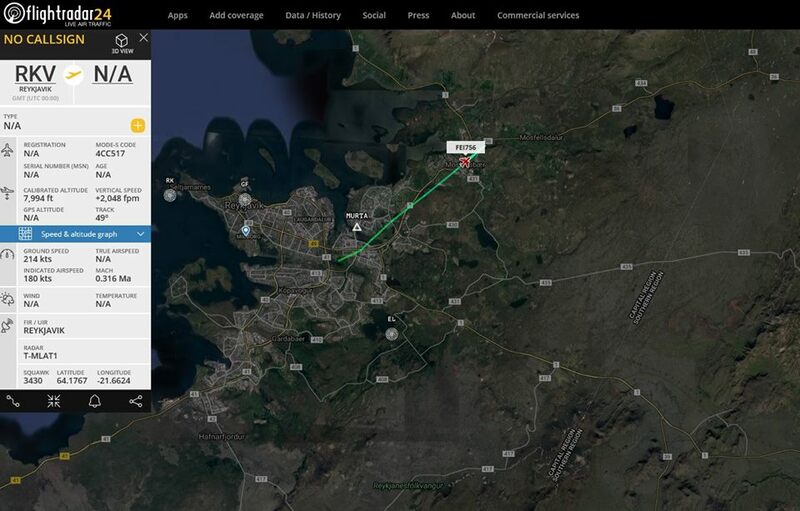 Flugfélagið Ernir (“Eagle Air”) flight FEI756 from Reykjavik to Húsavik is performed by the newest addition to its fleet – Dornier 328 (reg. TF-ORI). 32-seater is the biggest aeroplane for the whole history of the airline, which had been started almost 50 years ago with the only single-engine aircraft. President & CEO of “Eagle Air” Hörður Guðmundsson remembers that he had founded the airline in 1969 almost by the occasion when his service with ambulance flights met a huge demand from a regional hospital. “I and my wife had started this company in Ísafjörður, on Western fjords peninsula. In 1969, when, as I can say, we were too young to know what we were doing”, Hörður Guðmundsson told Flugblogger. Western fjords are a remote part of the island and 50 years ago the roads led not to every place and even existed ways were not available over a year. “At the beginning, my initiative was only to stay there for three summer months. Then doctors in regional hospital encourage me to keep the service because they used the flights to go to visit the patients all around the area. The roads were blocked during six months in the winter time back then. So, I stayed over the winter time and with these doctors we visited almost every farm in the area”, Hörður Guðmundsson said. 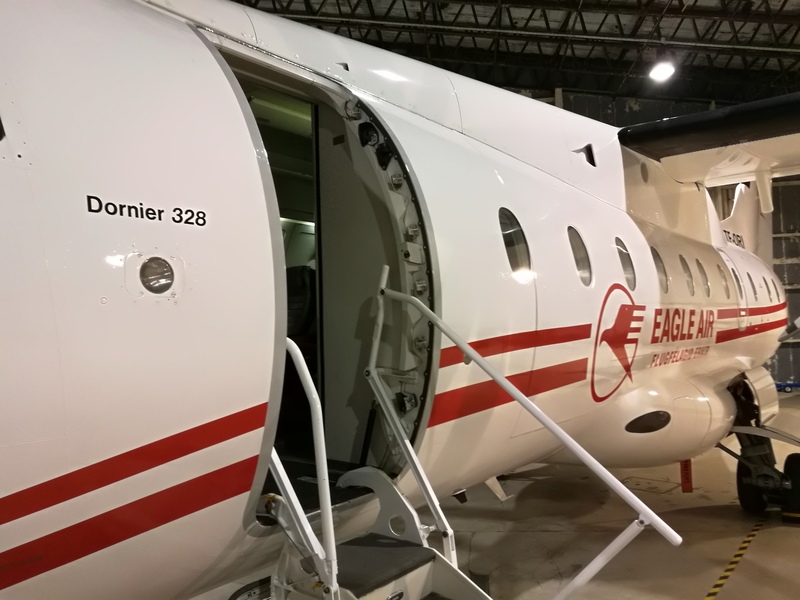 Together with occasional charter flights “Eagle Air” was providing air ambulance service for 2 years, when the Icelandic government established a new mail delivery system, stepped out from century-based boat network and shifting to planes. “Eagle Air” joined the state service and soon after had added to its fleet first multi-engine aircraft – Piper Aztec. Few years after a first regional airliner came to their fleet, it was Britten-Norman Islander. Together with fishing industry boom in Iceland at the beginning of the 1980s, “Eagle Air” expand its operation and bought new Cessna 404 Titan. Hörður had started to fly between fishing companies’ facilities, serving their interests. At the end of the decade, they collect enough means to add DHC-6 Twin Otter to their fleet. At that time there still was a monopoly on regional flights, which Hörður could not break even with help of Ísafjörður town authorities, who were interested in better service with the capital. 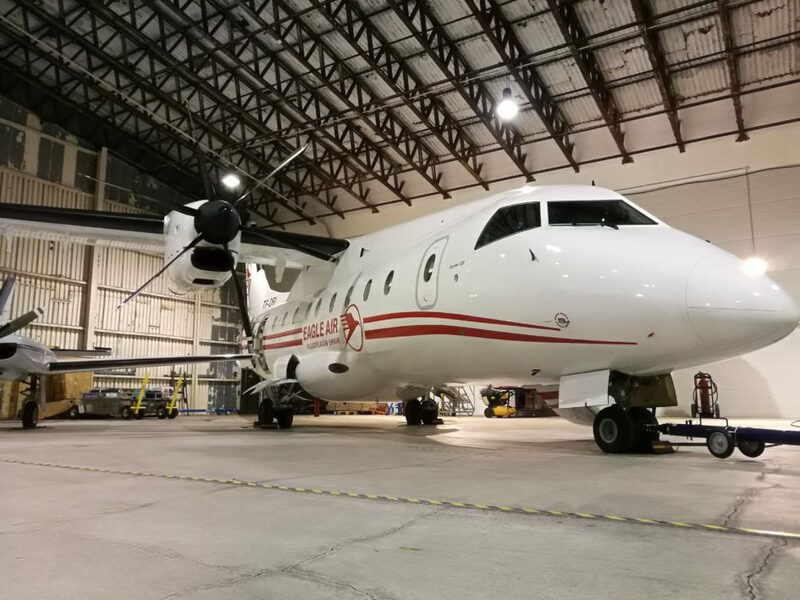 Occasionally “Eagle Air” had got an unusual request from Switzerland, where an airline asked for support United Nation humanitarian mission in Africa while their own aircraft is going through heavy maintenance stage. The contract was for there month only and Hörður accepted it. After the job was done another request had come from Red Cross and so on. During the next 8 years “Eagle Air” was performing operations in Kenia, South Sudan, Uganda, Angola and neighbour countries. At this period Icelandic branch of the airline was shut down. After the African period, Hörður started to fly for another Icelandic airline – Air Atlanta – on Boeing 737 in Europe and Philippines. At the begging of the 21st century, he decided the time to come back home has come. “In 2002 we moved everything from Ísafjörður to Reykjavik. We started with Cessna Conquest and all kinds of small flights within Iceland, to Greenland and Europe. We also had Cessna Caravan maiden in France. Then the government put some routes for tender for the year 2007. We joined the tender and send the offer, that is how we got these routes. Before we got them, in December 2006, we purchased first Jetstream 32, next one arrived a year later. Now we have four Jetstream’s 32, small planes have been sold. After our first tender, we are still keeping the routes, supported by the government for almost 11 years. It has been put it on tender two times since and no one beat us yet”, Hörður Guðmundsson said. He is talking about flights to Höfn, Bíldudalur and Gjögur, the place where only 50 people live. The flights are totally paid by the government and only 5 000 people move over a year. “Eagle Air” Jetstream’s 32 have served to the airline more than 10 years, and Hörður thinks that his airline deserves something new. He has listed several economic reasons for that, and the first one relates to his optimistic view on the domestic market in Iceland. 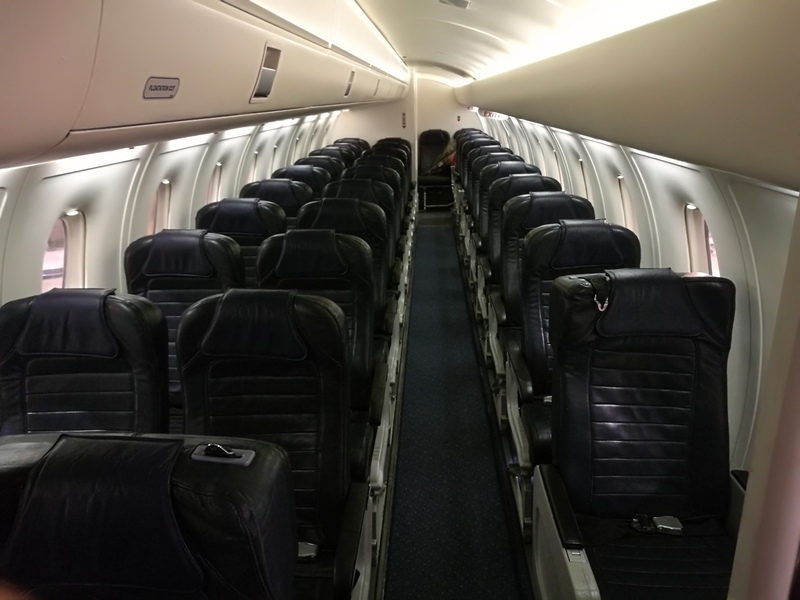 There are have 19 seats in the “Eagle Air” Jetstream’s cabins, which is enough for most of the airline’s routes. However, the airline faced bigger demand for the next year and Hörður decided to follow it. “There is a company, for which we will fly next summer, that has blocked 26 seats on every flight. There is kind of action tour, they cycle part of the route back in Reykjavik, they will go to lagoons and glaciers and accommodate in hotels for 4-5 days. I think it is about a week or 10 days tour here in Iceland. So, we have 32 seats in Dornier and 26 are occupied already”, Hörður Guðmundsson said. 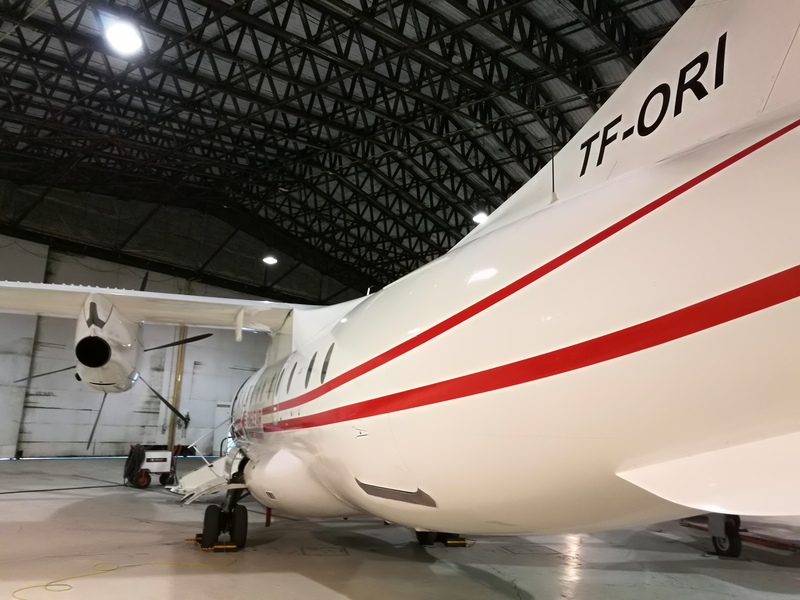 He added, that Dornier 328 has longer range and higher speed, compared to Jetstream 32, which, as he hopes, will allow “Eagle Air” to increase an offer for tourist’s charters to Kusuluk in Greenland with only 1 hour 15 minutes flight time. Then the tourists are not the only goal for “Eagle Air”. The significant part of their business is ambulance flights, for which Dornier 328 looks better than Jetstream 32. According to Hörður, there is a common practice in Iceland, when some patients with doctor’s support need to be delivered to Sweden for organ transplantation. Jetstream 32 can perform direct flight only if there is no strong headwind over the Norwegian Sea. In another case, the plane must land either in the eastern part of Iceland in Egilsstaðir or in Norway for refuelling. It takes more time, costs and might be not good for patients. During such operations “Eagle Air” misses the aeroplane for 24 hours. Compare to it, Dornier 328 can fly directly from Iceland to Sweden despite a strong headwind. Another reason for Hörður ‘s optimism is a recent initiative, declared by several Icelandic parliamentarians. They suggest establishing new subsidies for those, who live far than 200 kilometres from major Icelandic town, which are Reykjavik, Akureyri and Egilsstaðir. Inhabitant will be able to obtain a 50% discount for 4 flights across Iceland during a year. Hörður believes it will significantly increase the number of passengers, compare to nowadays. “There are not many of them, but they travel many times over the year. We believe we can increase the number of people flying from Húsavik, for example. Now it is about 12-13 000 passengers on this route over a year. Together with tourists, we will have maybe 20 000 people”, Hörður Guðmundsson said. According to him, “Eagle Air” has about 60-65% occupied seats on this route, which is close to the average number in their network. However, there are some exceptions. There are only 5 000 people live on Vestmannaeyjar, a tiny island to the south from Iceland. Despite this, the route is used by 50 000 passengers every year. Hörður said, it is often sold out around weekends, so there is no empty seat on „Eagle Air“ flights in both directions. The new Dornier 328 with an additional 13 seats will allow the airline to become more flexible. Trying to fill bigger capacities they will be able to offer lower prices, following the strategy “better to fly with passengers who pay less, than fly empty”. During the conversation with Flugblogger Hörður considered the model, when one-third of the passengers will pay full price, the rest will have a discount through some special offer. 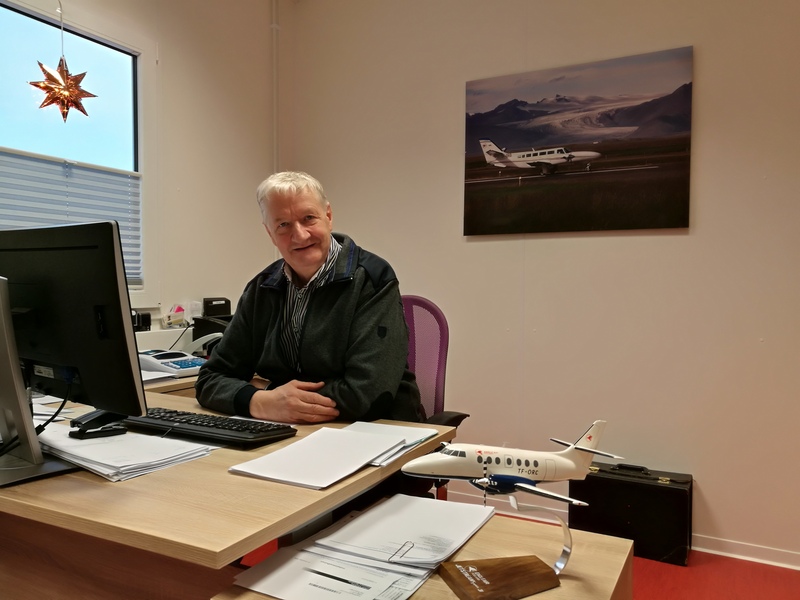 “This is the small family business, so we need to turn every krona before we spend it”, Hörður Guðmundsson said, explaining why he chose Dornier 328. According to him, the other option was Bombardier Dash 8 Q200. Then he found out the Canadian plane is slower and doesn’t meet other “Eagle Air” requirements. “We wanted both capabilities to fly to small airports with runway 800-900 meters and fast speed. Dornier has the speed to fly to Europe with a reasonable time, it has longer range and other advantages over Dash 8 Q200”, Hörður said. Dornier 328 has even more advantages compare to Jetstream 32, and one among others is the operational cost. In terms of fuel consumption, Dornier is hungrier for the fuel, but it is faster and has more seats. Hörður said, with similar load factor, the price for both planes will be the same. The same time Jetstream 32, which production was started the same year Hörður had founded his airline, getting older through the years and it is becoming more difficult to find a spare part for these planes. Exploitation of Dornier 328 begun in 1993, in addition, Hörður managed to find a good way for its spare parts supply. “We have good assets through another people to spare parts for this type of aircraft. 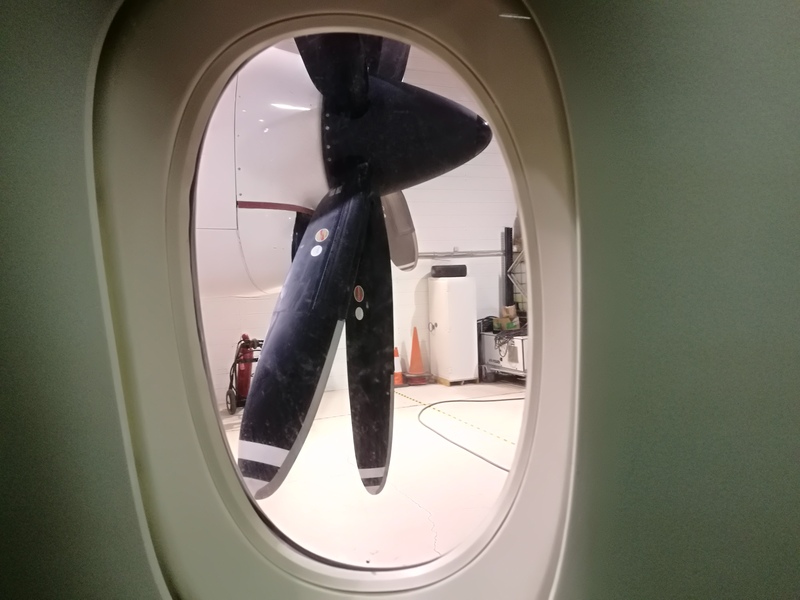 There is a friend of mine, who runs this aircraft in another country, he has been able to stock up a huge stock of spare parts”, Hörður said, “On the other hand, Jetstream is getting older, it is becoming difficult to get parts for it. The price of spare parts for it has been escalating during the last few years. There is a little market for this aircraft now to sell. The only real market for it is in South America or even Africa. So, might be next few years we will take this aircraft out or keep two aircrafts with two tore down for spare parts. Maybe we will have two Jetstream’s and two Dornier’s, we will see how it matches. However, it is very difficult, almost impossible, to run only one aircraft of each brand. I would say, the best to be is to operate three Dornier’s and skip the other things. But the Icelandic market is very small. We have to be able to serve both: big touristic groups and business trips with only 5-6 people”. 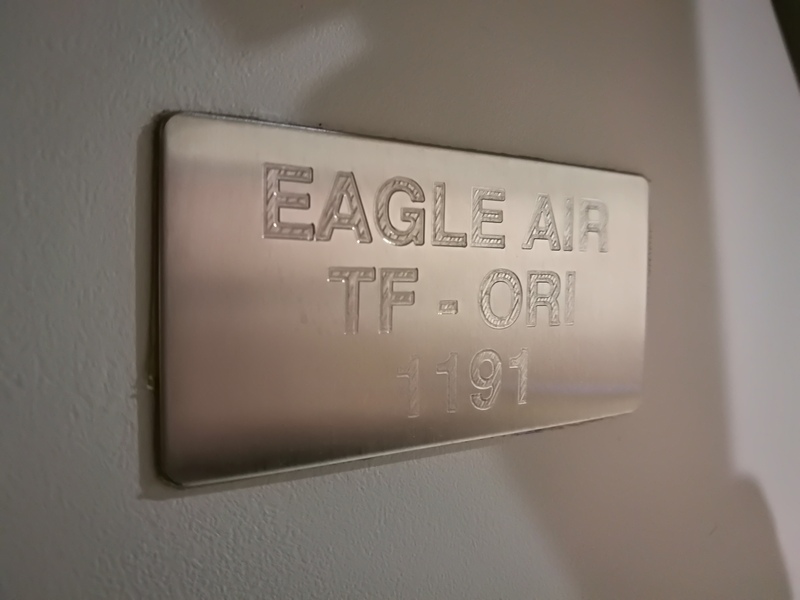 TF-ORI was bought by “Eagle Air” through the loan in a bank. Meanwhile, the second Dornier might arrive next summer. It is unclear for now how “Eagle Air” will get another one. “Probably it will be leased or maybe this friend of mine will park his aircraft here and we will operate it”, Hörður Guðmundsson said. Meanwhile, the airline continues to train its pilot for the Dornier 328. First three pilots have finished ground and simulator training. After the base flying stage and obtaining type license, now ready to perform flights under overwatch of experienced flight instructor and Dornier senior examiner Wolfgang Zellner, who joined “Eagle Air” for this period. Flugblogger met him near the plane in Reykjavik’s airport hangar. Wolfgang came to Iceland from Austria with 7500 hours on the Dornier 328 and overall 11 000 flight hours. 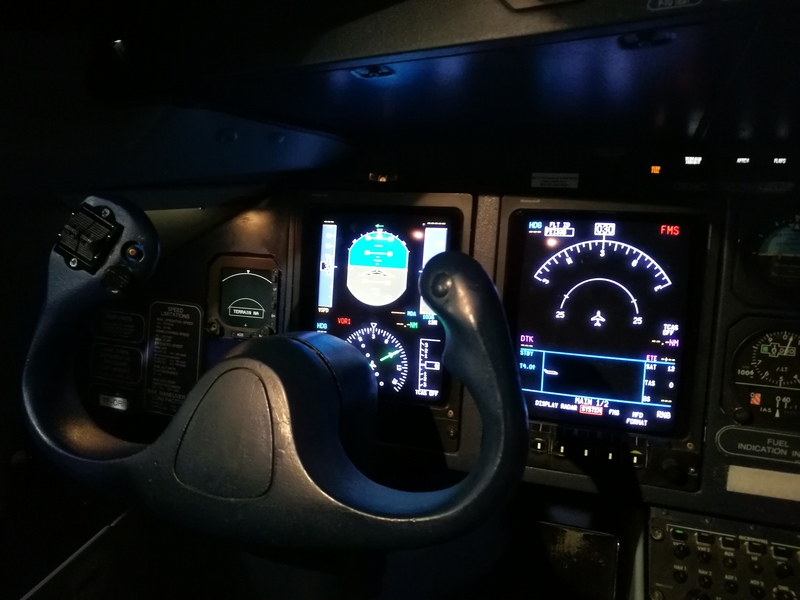 He explained that “Eagle Air” pilots will have to fly up to 40 sectors, where one sector means a flight with, at least, 15 minutes in the air. He summarized the full training for the type from ground level could take up to 3 months, depends on the weather and aircraft availability. 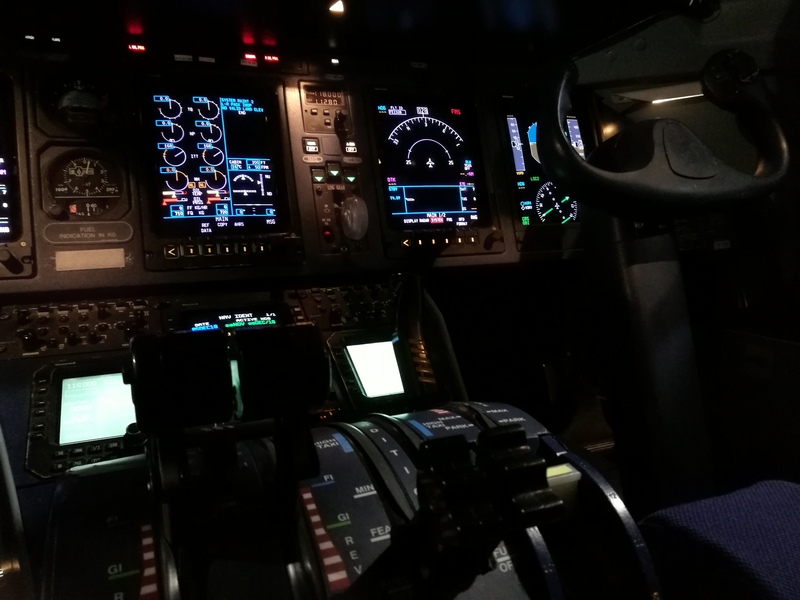 Hörður Guðmundsson said, two other “Eagle Air” pilots finished their simulator stage in Madrid these days and are expected in Reykjavik until the end of the week. 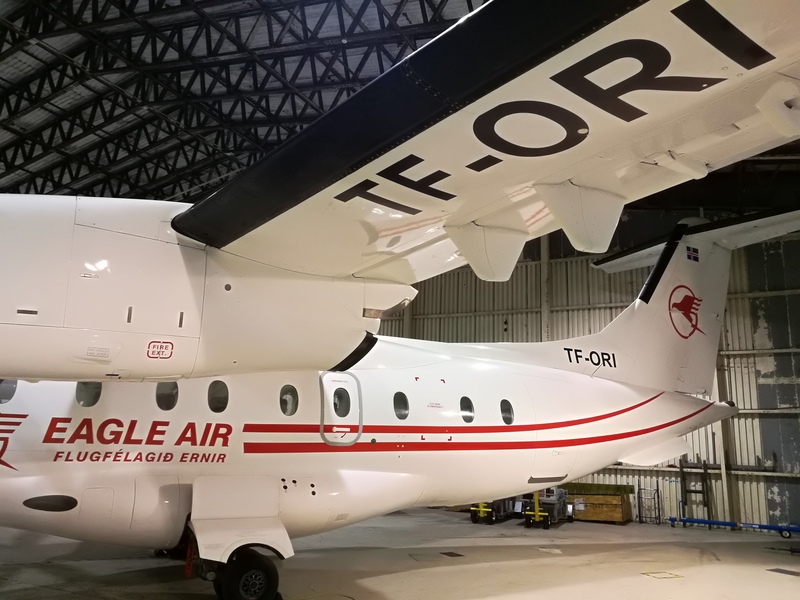 All of them will need to fly their line introduction sectors, which means Dornier 328 TF-ORI will be often used for regular “Eagle Air” flights for a while.